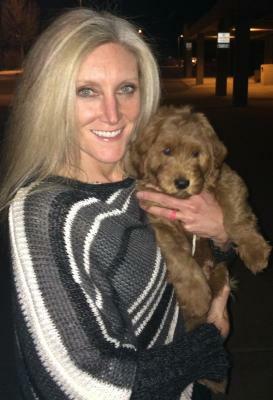 Goldendoodle puppies throughout the U.S.
Hi! Welcome to Montana Goldendoodles and Labradoodles. I'm Crissy and I have been richly blessed with dogs! I feel that God has led me to this wonderful art of breeding doodles. I do not take this opportunity lightly, and approach everything prayerfully! In my program I strive to provide you with only healthy, socialized and beautiful puppies. My parent dogs are tested, my puppies socialized with Puppy Culture and The Monks of New Skete and all are fed high quality food and supplements. My puppies are a blessing to our family and so loved. If you are looking for a Goldendoodle breeder and you are reading this letter, let me assure you that you couldn't get better than Living Streams Goldendoodles. I personally asked Crissy if I could write a testimonial letter, because I feel so strongly about recommending them. 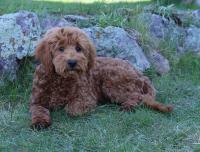 When we were first searching for a new family member, I looked at every Goldendoodle breeder website in the US and Canada, and I contacted several. Some of them never bothered to get back to me, while others made me feel uncomfortable. When I finally found Living Streams and saw a picture of Kairos's litter, David, my 13 year old son and I knew we had found the right place. Every puppy in the picture was beyond adorable, so David immediately sent Crissy an e-mail. Within about fifteen minutes, Crissy had returned his e-mail and called us back. She was so sweet and understanding about our excitement. She answered all our questions and more. Luke just aced his CGC test this evening. He is an amazing boy and I love him beyond words. We were in this class with 6 other dogs. Luke was the youngest and smallest in the class. Two of the other dogs were short haired collies and their mom shows them in obedience classes in large dog shows. He truly was the best and most well behaved dog there. He passed each test like a rock star. He works off leash like he is glued to my side. He sits and holds and stays even when I am out of sight. When I call him he rockets over to me and sits immediately on my left side. He is beyond smart. I adore him! Luke and I spend countless hours together mostly just hanging out. We walk together every day anywhere from 4-10 miles each day. Last winter Luke and I took CGC and passed with flying colors. We went on to do therapy dog...which Luke tolerated for me because he is at heart not really a social boy. We went on to do a Rally class with dogs that had worked with the trainer Adele Delp, who teaches owners and dogs from all over the country during the summers at Yellowstone Dog Camp. He was the star of her Raley class. Hands Down. Going in he and I knew nothing about what rally was about but we like working together and he is so tuned into me that we went through every move, every class with or without a leash, wit absolut perfect moves. He is stuck to my side. Luke is stuck to my side day in and day out...and nights too. He sleeps so close to me in bed some nights I'm not sure there is room for me in the bed, yet he is secure enough to stay home alone when I have to go somewhere without him. He just lays down somewhere in the house and waits for me to come back.